“It’s always been a very strongly programmed festival,” said filmmaker Jim Finn, a University City native who is one of three Charles Guggenheim Cinema St. Louis Award honorees this year. The 11-day festival begins Thursday. This, perhaps timely, collection won against high quality entries from students at Aberdeen (‘Pursuit of Knowledge 1790-1850’ focusing upon books read by the Brontë sisters). Interpreta ahora una heroína feminista del siglo XIX. ¿Qué resonancias pueden encontrar las mujeres de hoy en ese personaje? La exigencia de que se nos trate con igualdad y justicia. Es un novelón romántico. ¿Le gusta el género o prefiere otro tipo de lecturas? Sí, me gusta mucho. 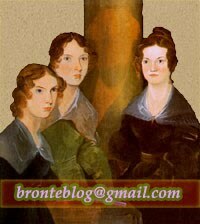 Leí Cumbres borrascosas, de Emily Brontë, muy joven y fue la primera vez que disfruté leyendo. SBS (Australia) is discussing the most recent Bond film. It’s the reason I can love Jane Eyre’s feminist spirit but simultaneously feel perturbed by her missionary zeal to convert Indian women, and nonchalance in shoving ‘crazy’ Jamaican Bertha into an attic (white lady feminism 101). The secret love of Charlotte Brontë on Luján Fraix (in Spanish); the Brussels Brontë Blog continues exploring the Rue d'Isabelle in Belgium; Sabor a Tinta (in Spanish) reviews a recent edition of Jane Eyre. Halloween In Penzance And Haworth as covered by AnneBronte.org.